We’d love your help. Let us know what’s wrong with this preview of The Fires of Merlin by T.A. Barron. There has never been a magic like Merlin’s, and T. A. Barron reveals how the legend was born in his adventure-loving five-book epic featuring the heroic young wizard and his unforgettable band. To celebrate the epic, which has sold over a million copies, Philomel has created a stunning paperover-board edition with fantastical new cover art by Justin Sweet to enchant and enthrall a whole new generation of readers! To ask other readers questions about The Fires of Merlin, please sign up. Another solid five star novel. I wish I had started counting in book one how many times Merlin has been knocked unconscious. By the end of book three we are over ten for sure. I love that this series has many strong female characters and is not centred around romantic interests. Je tiens tout d’abord à remercier, une nouvelle fois, les éditions Nathan, pour m’avoir permis de découvrir ce roman, en avant-première. Je me suis une nouvelle fois régalée, avec les aventures du jeune merlin, sur l’Ile de Fincayra. Merlin qui manque encore de confiance en lui, et doute encore de pouvoir devenir un puissant enchanteur, va devoir dans ce tome, affronter un terrible dragon. En effet, Valdearg qui avait été plongé dans un sommeil profond depuis de longues années. Mais pourquoi s’es Je tiens tout d’abord à remercier, une nouvelle fois, les éditions Nathan, pour m’avoir permis de découvrir ce roman, en avant-première. Je me suis une nouvelle fois régalée, avec les aventures du jeune merlin, sur l’Ile de Fincayra. Merlin qui manque encore de confiance en lui, et doute encore de pouvoir devenir un puissant enchanteur, va devoir dans ce tome, affronter un terrible dragon. En effet, Valdearg qui avait été plongé dans un sommeil profond depuis de longues années. Mais pourquoi s’est il réveillé ? Apparemment, le dragon est persuadé que ses petits ont été assassiné par Merlin. Comment va-t-il pouvoir lui prouver son innocence, ou dans le cas contraire le combattre et survivre alors, que quelqu’un lui a dérobé ses pouvoirs avec un terrible sortilège. La première partie de ce roman concerne le voyage de Merlin, accompagné de Rhya, vers la cité des nains. Merlin doit s’y rendre rapidement pour aider ce peuple, qui est menacé par Valdearg. J’ai trouvé cette première partie, un peu longue, et je dois dire que je m’y suis un peu ennuyée. Il ne s’y passe pas grand chose, et Merlin m’a quelque peu agacé, par son ignorance, ou ce qu’il ne voyait pas, alors que moi, lectrice, je le voyais comme le nez au milieu de visage. Je l’ai trouvé un peu trop naïf. Par contre, à partir de la deuxième partie, les choses se corsent pour lui, et l’histoire commence réellement à s’étoffer, j’ai tout simplement adoré ! Il y a de nouveaux personnages, dont font partis Hallia et son frère. Ils sont très proche, et vont aider Merlin dans sa quête. On y retrouve certains personnages des précédents tomes. Il y a de l’aventure, des péripéties, du suspens, de la magie, bien sur ! Il ne s’agit plus simplement d’un voyage, mais bel et bien d’une vraie quête, pour notre apprenti enchanteur. J’ai aimé ce livre, même si la recette reste quelque peu identique au roman précédent. J’espère voir évoluer rapidement le personnage de Merlin, vers un personnage gagnant en assurance, et un peu plus attentif à ce qui l’entoure. Voilà pour les points négatifs. Par contre l’auteur a su réinventer un autre scénario, en créant d’autres créatures magiques, de nouveaux personnages. L’écriture de ce livre est toujours aussi agréable, et c’est avec un plaisir certain que je lirai la suite, qui est prévue pour février 2014. Ce livre a été publié aux Editions Nathan en Août 2013. Really enjoyed the third installment in this series, and I love that they've added another strong female character - Hallia was lovely in every sense of the word, but also not someone I would want to be on the wrong side of! Excited to continue and see what else is in store for Merlin! The Raging Fires is the third book in T. A. Barron’s Merlin series. This is a good book, though it is a short read. I would recommend it to tweens and younger teens. It may get boring to older teens. Barron did a good job introducing new and unique characters in different ways. The ending is nice and concludes the book well. The plot is sort of boring, and the main character gets knocked out a lot. Other than that, it is a great book and very well written. Brilliantly written. I loved this book a lot. If you liked the Lord of the Rings or the Inheritance Cycle, than you must read it. The book started with Merlin and his family in their home in the forest. Merlin, as he tries to play the magical instrument he created is interrupted by a message from the dwarf leader Urnalda, instructing him to repay his debt by helping them with the dragon that had awoken. Merlin is forced to travel there and assist, but when he gets there he is ambushed and the dwarves still his powers. He is rescued by the deer-people, and they explore the area, then run into the hag Domnu. But as he continues, he discovers the reason for the rage of the dragon, and he is forced to continue on and confront the terrorizing "wings of fire". These are the examples of literature: "While her air draped her shoulders like a mantle of sunlight." This is talking about Merlin's mother, as she steps out of there tree to hear him play. "Slowly, slowly, it lifted, like the head of a worm edging out of an apple." This is describing his magical psaltery as it is beginning to tune itself. "Spinning slowly, they floated toward us, like a vast flock of butterflies returning home." This is describing the leaves of many trees, soaring toward his instrument. "His face had hardened, like a craggy cliff, yet it showed the shadowed lines of his fear." This is speaking of Cairpre's expression after they are warned of the dragon. "We stood as still as the charred scraps of my musical instrument." This describes Merlin and his friends reaction after they are told the prophecy of Merlin and the dragon. When the long sleeping dragon, Wings of Fire, is awakened and threatens to destroy the entire land of Fincarya, Merlin is tasked with defeating him to restore peace and order. Merlin is still developing and learning his skills and talents with magic and an ancient prophecy predicts his demise if he faces the dragon in battle. Filled with trepidation, Merlin sets off to locate the dragon and defend the land he now calls home. Along the way Merlin encounter other lethal foes, fiercely determined t When the long sleeping dragon, Wings of Fire, is awakened and threatens to destroy the entire land of Fincarya, Merlin is tasked with defeating him to restore peace and order. Merlin is still developing and learning his skills and talents with magic and an ancient prophecy predicts his demise if he faces the dragon in battle. Filled with trepidation, Merlin sets off to locate the dragon and defend the land he now calls home. Along the way Merlin encounter other lethal foes, fiercely determined to provide him with a disadvantage against the dragon, and some worse, kill him outright. Merlin must face not only formidable foes, but an inner struggle with his own mortality and magic. Can Merlin defeat Wings of Fire and save Fincayra, or will the dragon be the death of both Merlin and the land? Ich liebe es mir die Bücher von T. a. Barron aufzuheben, es ist immer wieder wahrlich eine Freude. Er beherrscht es wie kein anderer den Menschen mit der Natur und den Lebewesen die diese Bevölkern, zu verbinden. Das ganze geschieht jedoch so unterschwellig liebevoll, so das man die Liebe zur Natur in jeder Zeile und jedem Satz liest. Auch was seine Figuren angeht, so sind sie spürbar mit viel Vorsicht und Liebe gestaltet. Keiner von ihnen ist ein Held wie man ihn erwartet, gerade Merlin ist es Ich liebe es mir die Bücher von T. a. Barron aufzuheben, es ist immer wieder wahrlich eine Freude. Er beherrscht es wie kein anderer den Menschen mit der Natur und den Lebewesen die diese Bevölkern, zu verbinden. Das ganze geschieht jedoch so unterschwellig liebevoll, so das man die Liebe zur Natur in jeder Zeile und jedem Satz liest. Auch was seine Figuren angeht, so sind sie spürbar mit viel Vorsicht und Liebe gestaltet. Keiner von ihnen ist ein Held wie man ihn erwartet, gerade Merlin ist es nicht. In seinem handeln und denken, bekommt man das Gefühl einer wirklich Person gegenüber zu stehen, gebeutelt von Schuldgefühlen und so menschlich, aber gleichzeitig so weise wie ein alter Mann. Jede Seiner Prüfungen ziehen ihre Verbindungen zu seiner Umwelt und zur Natur. Es handelt sich hier nicht, um ein Kinderbuch, sondern viel mehr um ein Tief philosophisches Werk. 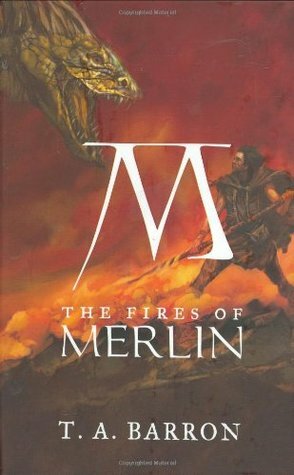 "The Fires of Merlin" by T.A. Barron set in the magical land of Fincayra is a story about Merlin and his journey to defeat Valdearg, a dragon. I found this book from reading the earlier books in the series and plan on finishing the series. Merlin is on a journey to defeat Valdearg in order to restore peace to the lands of Fincayra. Not only does he have to deal with a dragon he also has to worry about an organization who hates and tries to kill wizards. These wizards use creatures called Kreelixe "The Fires of Merlin" by T.A. Barron set in the magical land of Fincayra is a story about Merlin and his journey to defeat Valdearg, a dragon. I found this book from reading the earlier books in the series and plan on finishing the series. Merlin is on a journey to defeat Valdearg in order to restore peace to the lands of Fincayra. Not only does he have to deal with a dragon he also has to worry about an organization who hates and tries to kill wizards. These wizards use creatures called Kreelixes to steal a wizards power and leave them vulnerable. I thought how the book ended was rather sad but joyous for Merlin lost a newly found friend but regained something he lost. My favorite part of this book was when Merlin transformed into a deer and told how differently things were as a deer. Merlin must face the evils of Fincayra without his magical powers. The Kreelix have been awakened and are not only seeking to destroy all magic but magical creatures including the dragon eggs of Wings of Fire. Merlin feels as though he is the only one who can defeat the now awake dragon just as his Grandfather did, but wonders how he will do it since he has lost the Galator, his staff, his liar, and his powers. Like the others so far in the series, I feel like we spend alot of time on M Merlin must face the evils of Fincayra without his magical powers. The Kreelix have been awakened and are not only seeking to destroy all magic but magical creatures including the dragon eggs of Wings of Fire. Merlin feels as though he is the only one who can defeat the now awake dragon just as his Grandfather did, but wonders how he will do it since he has lost the Galator, his staff, his liar, and his powers. "A dragon craves life, devours it. Swallows it in great, heaping mouthfuls. He is not slain easily--and does not die tranquilly. He resists..."
I'm not really interested in this book so I decided to abandon it. In the Fires of Merlin, Merlin has to face many challenges that all lead up to his greatest challenge of defeating the dragon, Valdearg. These challenges include avoiding the magic-eating Kreelixes, recovering the Galator from Damnu, and discovering the secrets of the Wheel of Wye. After facing many challenges in this novel, Merlin learns a couple things about himself and others. He learns that magic is within himself, and that he cannot judge other people or creatures as evil just because they In the Fires of Merlin, Merlin has to face many challenges that all lead up to his greatest challenge of defeating the dragon, Valdearg. These challenges include avoiding the magic-eating Kreelixes, recovering the Galator from Damnu, and discovering the secrets of the Wheel of Wye. After facing many challenges in this novel, Merlin learns a couple things about himself and others. He learns that magic is within himself, and that he cannot judge other people or creatures as evil just because they are related to someone who is. I thought these were great lessons for Merlin to learn as he grows into the wizard he will become. I enjoyed this book about as much as I enjoyed the others. Again, it seems that I liked certain aspects from this book as I did in the others. The Fires of Merlin moves quite a bit slower than the previous novel, though a lot still happens within a short amount of time; however, it is still entertaining and interesting. Merlin discovers new creatures and people as he travels around Fincayra, which kept me entertained because they were all intriguing. I was also engrossed by the descriptiveness of this novel. T.A Barron does a marvelous job of describing the places, people, and feeling of everything and everyone throughout this book. You can really picture yourself being right next to your favorite characters and feel exactly what they are feeling. Overall, the plot was interesting, I loved the characters, and the detail was engrossing. I liked the sad, yet happy ending that may lead to greater things in the future. The Fires of Merlin was a great addition to the series! Anyone who liked the previous books will like this one. Don’t forget to read the previous two books before starting this one! The ancient dragon Valdearg was briefly introduced in T.A. Barron's "Seven Songs." So guess what the antagonist of "The Raging Fires" is! The third volume of this Arthurian fantasy epic introduces some nasty new beasties, magical threats and some explosive dragon action. Barron seems to have overcome his initial roughness, and allows the plot to flow as smoothly as his nature-based writing, as well as the introduction of some interesting new characters. After barely saving his mother's life, Emrys The ancient dragon Valdearg was briefly introduced in T.A. Barron's "Seven Songs." So guess what the antagonist of "The Raging Fires" is! After barely saving his mother's life, Emrys Merlin is relaxing with his family... only to have their peace destroyed when a monstrous magic-sucking monster called a kreelix appears. They were supposedly extinct, but have somehow reappeared -- and to make matters worse, Valdearg (aka "Wings of Fire") has awakened from his slumber, and is on the warpath for whoever killed his hatchlings. "The Raging Fires" sets aside the foresty Celtic symbolism of the previous two books, in favor of fire -- harps burn, lava burns, dragons blast fire, and homicidal anger rages out of control. He also seems to have exhausted his mythological store for the moment, because most of the magical goings-on in this book are pretty original creations. Barron's writing sometimes gets a bit overlush, but it's loaded down with haunting, detailed moments (the deer-people's transformations), eerie threats, and the occasional moment of comic relief (the baby dragon). But the story is overall very grim, particularly since this is the first of Merlin's stories in which his death seems to be assured. Whether or not he will actually die, there's a dark cloud hanging over everything he does. The biggest problem is perhaps the kreelixes -- they're an interesting idea, but they sound more like something out of Star Trek than Arthurian legend. I'm just saying. Merlin is a little older and wiser in this one, and he seems to be feeling the first stirrings of romantic feelings for the bland deer-woman Hallia. And Valdearg is a wonderful antagonist -- he'a an aggressive killer, but he's not evil and at times he even shows signs of dignity and endearing sentiment. "The Raging Fires" temporarily ditches the Celtic myth'n'legend, in favor of dragons and a few new inventions of the author's. A solid, richly-written fantasy. The "Lost Years of Merlin" series is not a must-read series of books for Arthurian scholars nor for fans of Merlin, in general. It is not part of any 'canon' nor does it purport to be the definitive story of Merlin's youth. What it is, however, is a nicely done story, told in a pleasing way and aimed at the YA market. The author does do a good job of recycling some Welsh history and legend as well as tell a fine story. I had read the first two books quite a few years ago, back when my children we The "Lost Years of Merlin" series is not a must-read series of books for Arthurian scholars nor for fans of Merlin, in general. It is not part of any 'canon' nor does it purport to be the definitive story of Merlin's youth. What it is, however, is a nicely done story, told in a pleasing way and aimed at the YA market. The author does do a good job of recycling some Welsh history and legend as well as tell a fine story. I had read the first two books quite a few years ago, back when my children were the target audience for this series. But I never did finish up the set and so when I was perusing my shelves for a quick weekend read, I remembered them fondly and chose to dive into this third book. This is the middle book of a 5-book series but I didn't get any of that "filler" feeling that sometimes accompanies middle books. This is a nicely-paced fantasy adventure, featuring a 14-year-old boy in the land of Fincayra, an "in-between" place before Avalon and a land shrouded in a veil of mist. Lots of traditional fantasy tropes are at play, including a prophecy that would lead you to believe there is just no way out for the hero other than to fight the good fight and die, thereby saving the rest. Just how that prophecy actually plays out, of course, is the basis for the plot. But there are also dwarves and dragons and taverns and forests, and deer-people (weredeer?) and all kinds of assorted fantasy characters and settings. Being the third book of the story of Merlin’s young years of growth we begin to expect more out of the fledgling wizard. As usual things don’t go exactly as planned, but that doesn’t mean that we’re let down, either. For a time during this adventure, Merlin is left without the use of his powers, but that doesn’t mean that he is completely hopeless. In fact, it is because of this that we see some important growth in him. Merlin doesn’t make as many mistakes this time, which is a relief for me aft Being the third book of the story of Merlin’s young years of growth we begin to expect more out of the fledgling wizard. As usual things don’t go exactly as planned, but that doesn’t mean that we’re let down, either. For a time during this adventure, Merlin is left without the use of his powers, but that doesn’t mean that he is completely hopeless. In fact, it is because of this that we see some important growth in him. Merlin doesn’t make as many mistakes this time, which is a relief for me after the last book. In fact, I actually feel proud by the way Merlin acted and the decisions he made in this one. You can really see more maturity out of him. I can’t really see anything wrong with this one. It’s a bit shorter than the other two, but it doesn’t suffer too much. As I said with the first book, the pacing is very fast because a lot needs to happen in a short time. With the first book, months went by, and so it was hard to feel the pass of time. It’s easier with this book because everything that transpires only takes a week. A couple new characters are introduced in this one. I like their characters a lot, because they feel very real to me, and I felt I cared about them in the end, which is good. I have a feeling they will be important later and this adventure was very necessary for their progression. Other than that there is not much new to say about this book. Read the reviews for the first two books to see what else I had to say. One thing, I like how Merlin is maturing and now he feels like someone I really could depend on. Il devient plus humble, et donc plus supportable. Les quelques pertes qui Ici, on voit Merlin s'engager dans une vraie quête, celle d'affronter un dragon enragé, Valdearg, qui est persuadé qu'un des ascendants de Merlin, voire l'enchanteur lui même, a tué ses oeufs. This was the third book out of twelve in T.A. Barron's Merlin saga. I have to say I really enjoy Barron's writing style. He is so descriptive and makes me feel the emotion of the scene quite easily. The book moved fast for me. Merlin is still young and still has his same characteristics and flaws as before. He is prideful and stubborn but also caring and understanding. He leaps into problems with little information. While this might annoy me in another book, this series is about how Merlin BECOME This was the third book out of twelve in T.A. Barron's Merlin saga. I have to say I really enjoy Barron's writing style. He is so descriptive and makes me feel the emotion of the scene quite easily. The book moved fast for me. Merlin is still young and still has his same characteristics and flaws as before. He is prideful and stubborn but also caring and understanding. He leaps into problems with little information. While this might annoy me in another book, this series is about how Merlin BECOMES the great wizard, not the great wizard he already is. So I feel these flaws open him up a bit and give him humanity and remind others us he is still a boy. I enjoyed the new characters this book brought. Wings of Fire is every bit dragon, consumed with anger for the loss of his children. The Wheel of Wye I quite liked, very different approach to an oracle. The deer people were very interesting to me. I enjoyed how they saw life and their traditions - I love meeting new cultures and even through the span of less. than half the book I learned much about them. I look forward to seeing more of Hallia. The stakes are higher than ever before in The Fires of Merlin, the third book in The Lost Years of Merlin epic. Merlin must save Fincayra once again, but this time it may cost him his life. With Wings of Fire awakening, Merlin and Rhia must go on a dangerous adventure that will take them across Fincayra once more, meeting all kinds of interesting people and creatures. What I really love about T. A. Barron’s writing is that he uses a variety of fantasy creatures, rather than just sticking with all The stakes are higher than ever before in The Fires of Merlin, the third book in The Lost Years of Merlin epic. Merlin must save Fincayra once again, but this time it may cost him his life. With Wings of Fire awakening, Merlin and Rhia must go on a dangerous adventure that will take them across Fincayra once more, meeting all kinds of interesting people and creatures. What I really love about T. A. Barron’s writing is that he uses a variety of fantasy creatures, rather than just sticking with all of the familiar ones. I mean, in what other series are you going to find living carnivorous rocks and endangered deer people? Barron uses his imagination and because of my rant about the lack of diversity in fantasy, I really appreciate the effort he put into his series. More fantasy writers should follow his lead. In addition to his excellent world-building, Barron really pays attention to his character development. Merlin has changed slowly over the past two books and his development continues in this book. We are finally seeing a bit of a transition from awkward teenage boy to slightly less awkward, more mature teenage boy. - This wasn't as good as the first two. It suffered from middle book syndrome. - Not a lot happened in the story. If all the fluff and traveling was taken out, this would be a very short book. - Merlin is so dumb. - I really liked Hallia and Eremon. They were fun new characters, and I just like the whole idea of deer people. - I don't think the dragon was evil, and I'm glad that was addressed. - There was a lot of traveling back and forth, and I just felt like if Merlin had done things in order, he - This wasn't as good as the first two. It suffered from middle book syndrome. - There was a lot of traveling back and forth, and I just felt like if Merlin had done things in order, he wouldn't have had to travel as much. It would have saved time. He should have gone after the Galator first, like people told him too! - I want a horse like Ionn! - I wish there had been more dragon parts. For a lovely rant on the issue of the contrivance of occurrences that just so happen to move the story go here . As to the rest of the book, I found it to be particularly less episodic in comparison to the other books, however I believe it does lack some progression that the other books have. The first part seems to move slowly, while the second part seems to be kind of useless, beyond the introduction of Eremon and Hallia. I wanted more Rhia and Cairpre. Perhaps it's my own love of those charac For a lovely rant on the issue of the contrivance of occurrences that just so happen to move the story go here . I wanted more Rhia and Cairpre. Perhaps it's my own love of those characters, but I feel the story deserved more past character involvement and less new characters. Although I love that we get a glimpse of Cairpre's adventurous side. "En résumé, c'est un troisième tome qui m'a beaucoup plu, contrairement au précédent. J'ai apprécié l'évolution des personnages, ce qu'ils subissent et vivent, et qui les aide à grandir mentalement. Les choix qu'ils ont à faire ne sont pas toujours simple, mais Merlin est rusé et intelligent. Le suspense et les actions sont très bien dosés, et on arrive même à s'attacher à ce dragon, qui est pourtant le grand méchant de l'histoire. Il me tarde donc de lire la suite (que je n'ai malheureusement p "En résumé, c'est un troisième tome qui m'a beaucoup plu, contrairement au précédent. J'ai apprécié l'évolution des personnages, ce qu'ils subissent et vivent, et qui les aide à grandir mentalement. Les choix qu'ils ont à faire ne sont pas toujours simple, mais Merlin est rusé et intelligent. Le suspense et les actions sont très bien dosés, et on arrive même à s'attacher à ce dragon, qui est pourtant le grand méchant de l'histoire. Il me tarde donc de lire la suite (que je n'ai malheureusement pas encore)." Fabulous! Took me long to finish because i was distracted by other books but overall it was an outstanding book. Theme: Things are usually not as bad as you think they will be. Theme: It is impossible to be certain about things. Theme: It is possible to survive against all odds. Theme: Act kindly without seeking ultimate reasons. Practice random acts of kindness. Theme: Look before you leap. Theme: Accepting a challenge leads to positive results. Theme: Courage is not the absence of fear, but rather th Fabulous! Took me long to finish because i was distracted by other books but overall it was an outstanding book. Merlin is minding his own business when, for the first time not his fault, problems arise in Fincayra. The emperor dragon Valdearg has awoken, and he is not pleased. Merlin must stop him, but how can he do so with his powers lost to him? This is perhaps my favorite book in the series so far. The story has changed pace, but I feel that it does a much better job than the first two. The dialogue has lost some of its wooden character, which is fortunate. My biggest concern is that T. A. Barron seems Merlin is minding his own business when, for the first time not his fault, problems arise in Fincayra. The emperor dragon Valdearg has awoken, and he is not pleased. Merlin must stop him, but how can he do so with his powers lost to him?